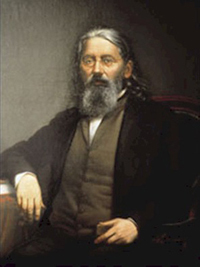 Dr. Constantine Hering was born on 1st January 1800 at Oschath in Saxony. He is respectfully considered to be one of the founders of Homoeopathy in America. At the age of 17 years he became interested in Medicine and joined the University of Leipzig, where he became the favorite pupil of Dr.Henrich Robbi, an eminent senior Surgeon who used to criticize Dr. Hahnemann and ridicule Homoeopathy. As Hering was an ardent student of science, he wanted to confirm the remarks made by Hahnemann and he repeated the Cinchona experiment. In winter of 1824, Dr. Hering received a cut in his forefinger of right hand while dissecting a dead body. The wound became gangrenous and the modern medicines could not help him and he was advised amputation. However, Dr. Kummer persuaded him to take homoeopathy and with a few doses of Arsenicum-album, his gangrene completely healed. Since then, Dr. Hering never looked back and his journey in Homoeopathy could get a new and strong direction. He enunciated the Law of Direction of Cure popularly known as “Hering’s Law of Cure”. Dr. Hering was the Chief Editor of ‘North American Homoeopathic Journal’, ‘The Homoeopathic journal of Materia Medica’ and ‘The Homoeopathic News’. He introduced Hering’s Law of Cure that is employed by practitioners even today to assess their cures. Hering began his medical journey as an orthodox medical practitioner but later in life, excelled as a homoeopath by his own experimentation and hard work. His journey ended on his demise in 1880, but he will remain immortal because of his vast invaluable contributions to the homoeopathic fraternity.